Thailand is dealing with horrible flooding right now. Despite the hardship, people still need to get around and go on with life so many have come up with clever hacks to make this disaster more manageable. [Jan] wrote in to let us know about this collection of flood-related hacks which he’s put together. They are wide-ranging, and many brought a smile to our faces, starting this the plastic-bag enclosed cars (not pictured). We pulled out three of them to highlight above. On the top left is a canine life vest fashioned out of empty drinking bottles mounted on some type of harness. 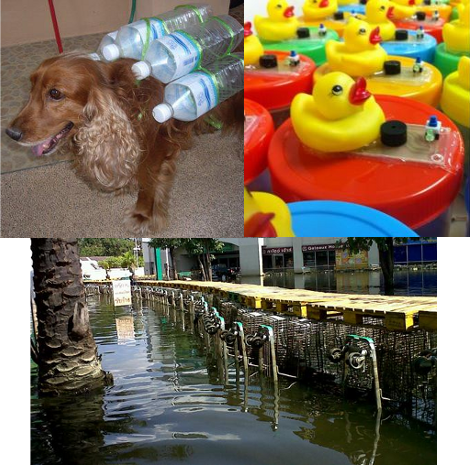 We hope the pets can stay out of the flood waters but this is a nice precaution. Speaking of precautions, the rubber-ducky to the right of that image is an electrical hazard detector. Float it in the water and an alarm and LED will go off if AC current is detected. Finally, the image on the bottom shows a bridge constructed in front of a shopping center by turning carts on their backs and lining the pathway with wooden pallets. There are several floating and amphibious vehicle hacks in the collection. So far we haven’t seen any drill-powered trolling motors though. My favourite has to be the motorised swan! Hot Damn that’s genius on so many levels. Rubber Duckie Im awfully fond of you! I am reporting this comment… FOR BEING AWESOME! so the duck is an alarm for electrified water? that’s quite a good thing to have, i imagine. I loved the shopping cart bridge. Genius. It reminded me of a program I saw on the Military Channel recently, which talked about the construction of combat trenches during WWI. Trench bottoms were not flat dirt, as one might assume. The water table was so high that there was always standing water in there, which was misery to soldier’s feet and damaging to the walls of the trench. The design depicted in the show involved the insertion of a series of inverted “A” frames into the V-shaped bottom of the trench. The sloping arms of the A-frame supported planks which shored up the trench walls. The cross-piece of the A frame supported “duck” boards… planking on which the soldiers actually stood. In the case of this hack, shopping carts take the place of the A-frames, and pallets take the place of the duck boards. Again, genius. Easy to fix with a bottle om his chest under his chin. dogs are naturally bouyant, the only reason for strapping floats to a dog would surely be if you intend to ride the dog as it swims through the water? +1 for cool kid skiing! It would be more useful to have the dog carry bottles of fresh water. That would be animal cruelty (bottles of water are heavy) and would drown the dog for sure. SO your telling me that you prefer to die of thirst than to let your dog carry some water bottles! You have no idea that human life is more important than animals. Im not saying that we should kill or mistreat animals, but you should be more concerned that people are dying. NOT that dogs are in danger of drowning! Its a dogs instinct to swim and can easily carry 10lb of water while they swim. Water bottles in water, only weigh as much as an empty bottle…. Yes, I would carry the water myself, and share it with the dog if needed, and exactly because I’m a human. Why do I think that if half this stuff was done here the government would send around people to ticket you? The government will let you drown but God forbid you actually try to help yourself, can’t have that! I think it’s more a sign that the whole world is realizing that their leaders are all too hopeless and that you should just help yourself, it’s also part of the ‘arab spring’ and such I think, people are stopping seeing their country’s leaders as somehow special and see they are no more special than the next guy. The motorcycle with the snorkel is incredible, if I didn’t see a video of it I would never have believed it. The duck is also brilliant, and could save some lives. My favourite is that genius snorkel-cycle hack, absolutely brilliant. [Sorry for not replying sooner] I’ve ever soldered some of FloodDucks. Circuit contains three transistors to detect stray voltage.